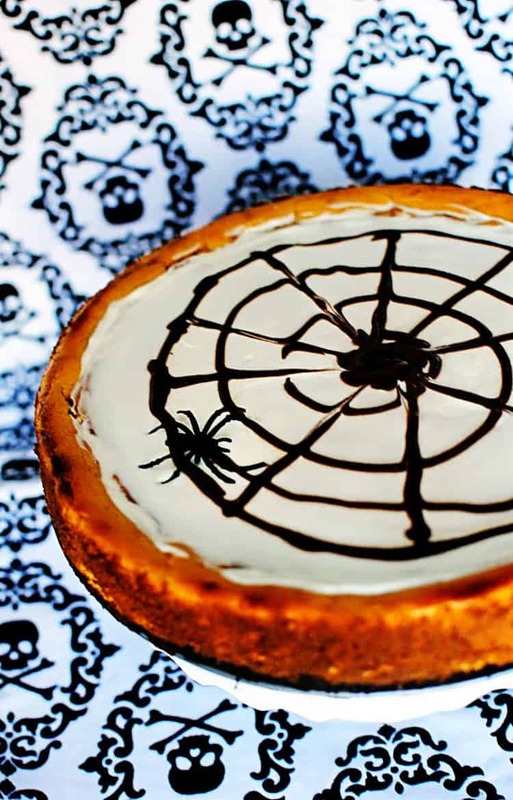 This Halloween pumpkin cheesecake is a rich, creamy pumpkin flavored cheesecake, decorated to look like a spider web. Fun to make, too! I am the queen at saying things that make you want to chew on your toes. THE Queen. If the position for emperor is open, I am certainly in the candidacy soon to be running for overlord. With this little tidbit of knowledge in mind I’m going to share a story. See, I told you, the queen. Let’s change the subject and bake a Halloween pumpkin cheesecake. If you’ve tried this Halloween Pumpkin Cheesecake recipe, or any other recipe on passthesushi.com please don’t forget to rate the recipe and let me know where you found it in the comments below. I love hearing from you! You can also follow along for more good eats and travel tips on Instagram @passthesushi & @girlcarnivore, Twitter & Facebook. Preheat oven to 350°F if using a silver 9-inch springform pan (or 325°F if using a dark 9-inch nonstick springform pan). press firmly onto bottom of pan. Set aside. Beat cream cheese and sugar in large bowl with electric mixer on medium speed until well blended. Add pumpkin and pumpkin pie spice; mix well. Bake 50 to 55 min. or until center is almost set; cool slightly. Carefully spread sour cream over top of cheesecake. Place chocolate and 1 tsp. butter in small microwaveable bowl. Microwave on MEDIUM (50%) 30 sec. Drizzle over cheesecake in spiral pattern. Starting at center of cheesecake, pull a toothpick through lines from center of cheesecake to outside edge of cheesecake to resemble a spider's web. Isn’t this Halloween pumpkin cheesecake the perfect thing for a Halloween party? Awwwwkward. I can’t even imagine how uncomfortable that would’ve been. At least you have a good cheesecake recipe to follow up the long pause of an awkward conversation. It looks yummy. I would be your lady-in-waiting if you became Queen, Emporer or Overlord. Hahahaha…what a booboo and so funny. I would have done the same. My husband says I have diarrhea of the mouth! I’m sorry for laughing…bless the zombie dad’s soul. Great spider design! Well this looks delicious! I love the decoration of the cheesecake! So clever <3 Thank you for sharing such a cool idea! I loved your story that you added before giving us the recipe. And now I can bet the cake would taste heavenly. The decoration is perfect for halloween. I have never seen anything like this! I’m looking for recipes for a halloween baking day tomorrow, and this is perfect! Can’t wait to try it out! That is the cutest dessert ever! I’m going to a party, and this looks like the perfect dish to take!! Omg! I love these ideas for Halloween! I want to try this. What a genius idea! Thank you for sharing this. Yumm! 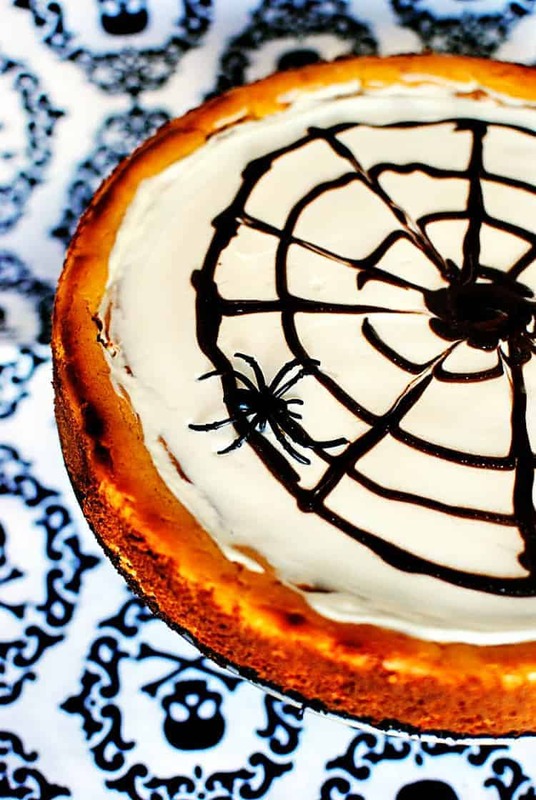 I love the spiderweb design on this cheesecake! It looks so tasty Pumpkin cheesecake. This is perfect treats on Halloween! I want to make some. Oh gosh I am not sure what I would say in that situation but love uncomfortable jokes at the same time…lol! But this recipe looks and sounds amazing! I def want to make this! Oh wow this is the perfect cake for a spooky Halloween party. It sounds gorgeous and definitely something I would love to try. This is great! I love the web design on top and the pumpkin flavours are just delicious, I’m sure. What an awkward conversation. I bet zombies would like this cheesecake. 😆 This is such an awesome idea and looks delicious! I love all things pumpkin and I love cheesecake. Such a great combination of flavors and your pictures make me want to try this asap. Omg can we say yum?!? I just love Cheesecake!! Perfect treat for Halloween! Cheesecake is my favorite dessert, but once added with Pumpkin – it’s just on a whole nother level. Yummy! I can’t wait to try this recipe for myself.